Many decks today are what we might call “clones”, usually of the Rider Waite Smith Tarot, simply copying the images in a different art style. I find decks such as these boring, and at times I find myself wondering if the creators were just out to make a quick buck, selling the integrity and ingenuity of the creative process for an easy money maker. Unfortunately, many of these decks end up being praised as good beginner decks, when in fact I believe we have the Rider Waite Smith for that already. 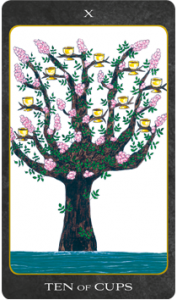 As such, I was very pleased to find in the Tarot House deck a marvellous tool for beginners who wish to use the Tarot for personal development and healing, that doesn’t clone the RWS. 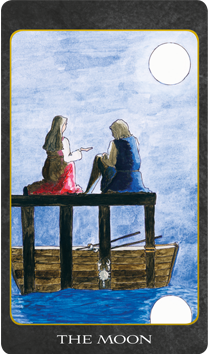 Before I received the deck I visited the creators’ website, and was happy to discover that the Tarot House is a mother/daughter collaboration. Now, I’m a sucker for beautiful mother/daughter relationships, so I was eager to see the results of such a creative partnership. Jenny, the daughter, is a Reiki healer and Tarot reader, who uses the two in conjuction for healing, rather than using Tarot solely as a fortune telling device. 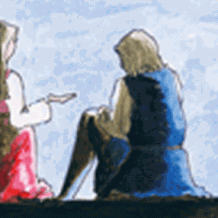 Tricia, an artist, decided to help Jenny achieve her dream of a Tarot pack that reflected her ideas about Tarot and how it should be used, and the Tarot House deck is the result. What I like most about this deck is that, even though the Major Arcana largely reflect the RWS tradition, the images are different enough that they allow an experienced reader to discover a new perspective or nuance of each card. 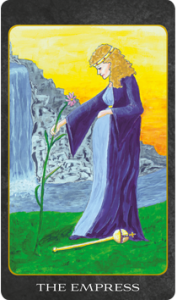 For instance, the Empress is still pregnant, still has her sceptre of power, and still sits in front of a river with a waterfall, but in the Tarot House she has left her sceptre on the ground and her hands reach out to grasp a tall, pink flower instead. In the Tarot House, the Empress’ creativity is channelled towards natural growth rather than enforced or organized growth. The Hierophant is no longer a sallow-looking priest garbed in clerical vestments, with two acolytes kneeling before him, but instead a seated man studying a large book on his lap, a pile of books next to his chair. The learning of traditional wisdom here is dictated simply yet powerfully, and the Tarot House has removed the imagery that has caused so many Tarot readers to look negatively at the Hierophant. I was also delighted to see Sun and Moon cards that seem to reference the older Tarot traditions, in which a couple are depicted. In the case of the Sun, they are celebrating joyfully, and in the case of the Moon they look like they are meeting clandestinely beneath La Lune, having rowed to a seclude place in their boat. The Strength card also references some of the earlier decks that show a man in combat with a beast, rather than the more well-known image of the maiden gently taming a lion. looking through each suit I began to realize that instead, the creators have depicted the creative process or growth and evolution of each suit in a subtle fashion, and the meanings of each card similarly: the Cups are borne by a tree, and the state of its branches, leaves and blossom, the pattern of the cups tell the reader about the nature of each card. The river running beneath the tree in each Cups card also tells a great deal: it may be still and smooth, or choppy, or beginning to calm after strong winds; and the tree is sometimes blown by these winds as well. 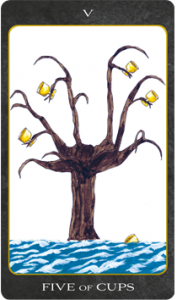 The suit of Wands shows the staffs and a ring of fire, and each card further into the suit adds another staff to a formation that looks like somebody’s attempt to build a structure. The stability and shape of the structure tells us a lot: the Four of Wands is completely stable, the three staffs that came before supporting fourth staff, like the pillars of a temple or walls of house; in the Six of Wands four staffs support a fifth that lays flat as a platform, holding up high the sixth staff. This spoke to me as a singular purpose, achievement, ambition or person being held up on a pedestal by those supporting or feeding it. This version of Minor Arcana reminded me of a mix of the Thoth tradition, with the symbols of the suit in formations that evoke meaning, and the Marseilles tradition, in which foliage seems to grow around the suit symbols to evoke the meaning. I am not sure a complete beginner would be able to read these Minors as easily as a scenic deck, however, but for a more experienced reader they certainly provide an interesting perspective. Out of all the cards in the Tarot House deck I found the Court Cards the most difficult to approach. 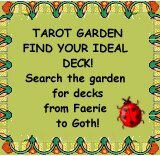 As with many Tarot decks, they seem stuck in the medieval mindset and imagery dictated by their titles, and they lack symbolism that the modern reader can relate to. Whilst there is some symbolism present – the Kings and Queens of their suit wear the same colour cloak, their manner and body language suggest meanings – I found myself using my already-present Tarot knowledge to crowbar the images into my pre-conceived ideas. Although I did like the Pages – they are all depicted doing something that evokes meaning, e.g. 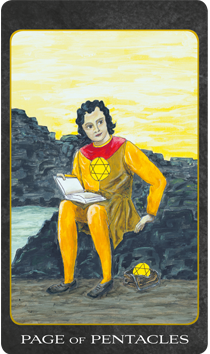 the Page of Pentacles is seated on a rock, studying a book, with a large coin in a purse at his feet. The artwork of the Tarot House deck can best be described as naïve and bold, with strong colours that at times reminded me of the Glastonbury Tarot by Lisa Tenzin-Dolma. It has retained firmly the medieval imagery that is suggested by the Major Arcana titles and the Tarot’s rich history and symbolism, yet the images still have something unique and different about them. Certain readers may take issue with the very literal Devil card in this deck (the image shows the Devil himself as a goat-foot god with a pitchfork, dancing around and tormenting a weeping woman, surrounded by hellfire), which seems a strange choice of image for a deck that removes the tradition image of Christian Judgement Day from the Judgement card and replaces it with a woman kneeling before a heavenly board of cloaked judges. Another interesting feature of the Major Arcana in this deck is that there are no numbers on the cards, only their titles; this might do away with the Fool’s Journey in this deck, but for me this is a bonus – the Fool’s Journey can sometimes restrict thinking and make it difficult for beginners to see the subsequent Major Arcana as more than characters the Fool meets on his journey. The Tarot House deck arrives in an attractive brocade drawstring bag of your colour choice (check out the bags here), and each deck has been given Reiki healing – not something I personally set much store in, but I always appreciate positive energy! It also comes with a very short leaflet that gives meanings for the cards, although these meanings focus more on self-development and positive affirmation than on fortune-telling. The two extra cards one often finds in Tarot packs have three spreads printed on them, one of which – the Chakra Reading – I found very useful as a method of self-analysis. Unfortunately, there is one aspect of this deck that I disliked: the card backs. I like a deck with something nice to look at on the back, whether it’s a piece of artwork from the artist, or a simple pattern, but the Tarot House card backs are the logo of the Tarot House, printed twice so that the cards can be reversed. This reminded me so much of Tarot franchises such as “Miss Cleo” that had a brand name to advertise (although even the Miss Cleo Tarot Power deck didn’t have a logo on its card backs! ), and I feel that a deck so strongly medieval in theme would better fit a medieval design on its backs. This deck benefits from being clear, approachable, bold and simple. It’s not overloaded with occult symbolism and is easy on the eyes. It would be a great starting point for those a little afraid of Tarot, as it is what I would describe as a “neutral” deck: it has no real theme or agenda to perpetuate, doesn’t adhere rigidly to a single Tarot school, and is, basically, Tarot for Tarot’s sake. Thank you very much for taking the time to review our deck in so much detail. We appreciate all the comments you have made and the review contains some really useful feedback for us. You’ve fully understood the story behind the deck and relayed our approach/intention perfectly. My mum is thrilled with the insight you’ve provided into her artwork too, she loves to hear how people personally interpret her artwork.